Considering culinary school? Well then… this one is for you. 9 months, several cuts and a few burns later, it hasn’t been easy by any means. But what a ride it has been. It all began 9 months ago on that very first day of school. Only this was a little different. Experienced career chefs sat next to mothers. Kids fresh out of school next to supermodels. Disenchanted ex-corporate types beside artists. All gleaming in our freshly pressed chef’s whites. All united in our love for cooking. All raring and ready to embark on our own personal culinary journeys. But if you thought being a food blogger and keen home cook prepared me for the challenges of a professional kitchen, think again. First, there’s the standing on your feet all day and the sudden discovery that there are muscles and pain receptors in your back you never knew existed. I guess that’s what 5 years of number crunching and sitting idly in front of computer screens does to you. Then, there are the super early starts. With kitchen sessions kicking off as early as 745am, you might want to reconsider a career in the catering trade if you are not a morning person. And be prepared to put in the hours – the average working day for a chef puts the corporate world to shame. What I found most difficult of all though was getting to grips with the time pressure. The professional kitchen environment is a whole different ball game to making something at your own pace at home with the music on in the background. Spare a thought the next time you see someone freaking out on Masterchef and throwing some incomplete mess onto a plate as time runs out… I’ve been there. Believe me, trying to plate something up when you are already late with the chef shouting down your throat isn’t easy. And who can forget the memories of split hollandaise sauces, leaky pastry cases and disintegrated potatoes amongst others – hours of blood, sweat and tears down the kitchen sink. Ironically, this blog – the inspiration for me signing up to culinary school in the first place – has been rather neglected over these past few months as well. Fact: when you cook, taste and look at your own food all day long, writing about it in your remaining waking moments may just be the last thing you will feel like doing. What’s more, with normal meal times out the window and foie gras, truffles and heavy cream sauces featuring frequently on the breakfast menu, I found my cravings shifting from haute cuisine to junk food and Chinese takeaways. And I mean the real stuff i.e. MSG-fuelled egg-fried rice from places with 2 stools and names like ‘Golden Pagoda’. With time however, I started to feel less incompetent. The chef’s knife began to feel like an extension of my own body. Saucing and seasoning soon became second nature. I even started to fold and roll-out puff pastry from scratch without the butter spilling out everywhere. The sheer quality of some of the dishes that I was churning out really surprised me. More importantly, as I got better at it all, I really started to find my element and enjoy the pressure. There’s an adrenaline rush you get from a successful service like no other. And as I packed up my finished dishes into tupperwares to bring home and cleaned down my station with copious amounts of blue paper towels each day, I would already be looking ahead to the next adventure in the kitchen. Looking back over the past 9 months, the huge array of techniques we Le Cordon Bleu students have learnt continues to amaze me. Everything from juicy, evenly browned meats to moist, perfectly cooked fish. The clearest of consommés to perfectly risen soufflés. 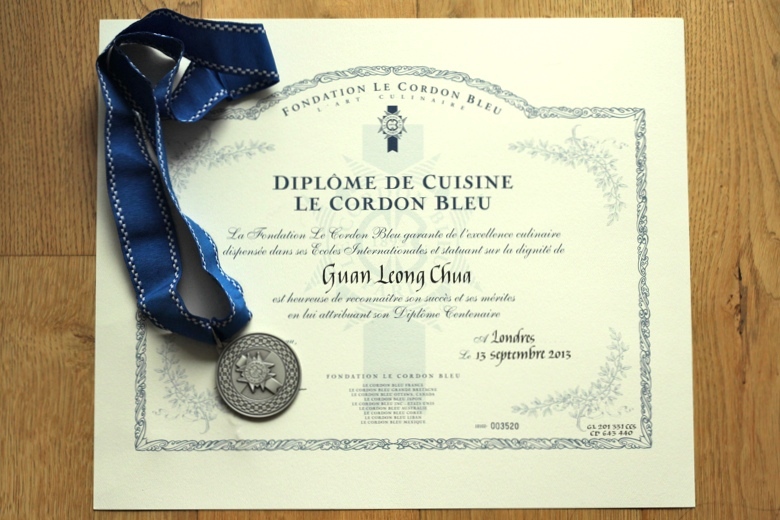 Yes, Le Cordon Bleu has gotten a little commercialised over the years and many often cringe at the sheer cost of signing up to the Diploma. But I assure you, the facilities don’t come more state-of-the art than LCB London’s campus. Having the chance to work with premium ingredients like Dover sole, lobsters and foie gras has been a real revelation – I never would have dared to buy, yet alone use such produce in the past. Plus, the opportunity to learn from such a highly accomplished team of teaching chefs with Michelin-star studded CVs ranging from the 1 Michelin star La Trompette to the 3 star Waterside Inn has been a real privilege. …some highlights from a rollicking 9 months! The most rewarding feeling of it all though? 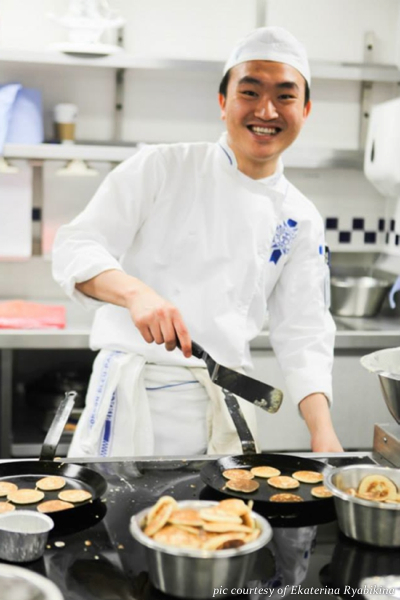 – the ability to harness all the skills I have learnt to create and innovate dishes I can call my own. Reproducing the more technical dishes from teaching demonstrations was all fine and dandy, but the sessions I truly enjoyed most were those in our final term where we had free reign to create our own menu and whip up something from a ‘Mystery basket’ of ingredients, Iron Chef style. It’s got to be the most exhilarating and rewarding of journeys I have ever chosen to embark on – one of those experiences that will forever be life-changing. I will most definitely miss it all, especially the fantastic group of fellow chefs I’ve met along the way. But as they say: one journey ends, another begins. Bring on the main course. AMAZING Guan! Congratulations on pulling through the 9 months! Having only done 1 cooking class and getting stares and occasional ‘what are you doing?’ from the teachers, I truly admire your pursuit in cooking. 🙂 Definitely very inspiring! @wendee: Thank you my dear =). We def have to catch up one of these days! Congrats Guannie!! Now come back to NY and cook up a storm for me and SY! @Nits: Tx!! Mann, can’t believe its almost been a year since I visited. Would love to come back but don’t think I’ll be able to squeeze a trip in this year. Maybe next yr? Wow! Congrats man! Proud of you!! Wana try your cooking sometime!! @KokHay: Thanks!! Been ages since we’ve caught up. Where are you based these days, Australia? Great stuff dude! You are definitely making it as a chef. Open up a restaurant in KL! @Innovative Baker: Might be something smaller scale first before I go anywhere near a restaurant i reckon. Should be back in KL end of the year (Nov / Dec time, still TBD). Catch you then! We only met a few times, but I am so proud that you did what all of us talk about doing but never actually get off our backsides to do, for whatever reason. Good on you! So, where to from here? @ Tash: Tx dear, a bit of a breather first then hoping to plot and host a supperclub at some point! I’ll be in London in Dec! @Tash: Small chance I might be back in KL, if not, lets def catch up. If there are any events in the diary, I’ll save you a spot – let me know what dates you’ll be here! Congrats Guan! Very well done! So what’s next and will i have the priviledge of trying your creations soon? @ Serena: Cheers Serena, thanks for the RT as well! Congrats and well done! Looking forward to tasting your food! @Cherry: Tx Cherry – let me know re ur upcoming Supperclub dates as well – would love to come at some pt! @breadetbutter: Thanks SY! yes definitely, let me know how ur schedule looks. Ah Guan, I loved reading this. Massive congratulations again, and yes, BRING ON THE MAIN COURSE! Feeling inspired now. Was thinking about enrolling for LCB patisserie diploma.. still thinking..
@AiPheng: Which LCB campus are you looking at? If in London, do drop me an e-mail if you have any questions re the experience. i’d like to know more on the LCB in London as i want to take up their patisserie diploma . hi guan, nice meeting you in weizhi’s wedding last night. congratulation, you are cordon bleu trained!!! hope there is a chance to try on ur dish! @Ivy: Hi Ivy! Thanks for stopping by the blog. Will definitely be referring to ur blog for tips when I’m back in KL. Let Jo and myself know if u r ever in London! Blog seems to be very interesting. It’s great pleasure to get a chance to comment on such an informative blog. Thanks for sharing and keep it up. @Kat: Good luck with superior exams! Is Chef Anthony still teaching most of it? He’s ace isn’t he! Yes, hope to stop by the school someday and catch up with some of the chefs and ex students who’ve stayed on to do pastry. Will let you know if I’m ever in the neighbourhood. Hi Guan! I’m starting Le Grande Diplome with culinary management this September and I was wondering if you might be able to give me any advice before starting! Congratulations on graduating! How do you feel the course opened doors for you 3 years on? @Sophia: All the best! I find the LCB and street credit it gives is still valuable in my line of Supper Clubs and Pop ups. I’m not sure about professional kitchens these days, but I reckon it will get you thru the door most places at least for a stage/internship… then the rest is down to you to proving yourself wherever you are…. Firstly I just wanted to say thank you for this amazing blog; it is truly inspiring, the way you followed your passion for gastronomy. I’m seriously considering applying for Cuisine at LCB London starting next Jan, and I wanted to know how busy the schedule was for you – did you have any days off during the week? @Geoff: Thanks for the kind words! I did the 9 month Cuisine Diploma back in 2013, and we tended to have cuisine classes spread over 3 t0 4 days each week so there was about 1 – 2 days off each week… the off days tended to vary though! I had coursemates on the Grande Diplome who studied Cuisine + Pastry concurrently and they tended to have classes on my off days i.e 5 to 6 days a week. If I’m not mistaken, I think LCB have recently introduced an accelerated 6 month course so if you go for that route, my guess would be the schedule would be more packed. Best to check with the school to see if there have been any changes in their class scheduling! Good luck whatever you decide and go on to do.